Considering the experience of Sikhs in America. As a Sikh child who grew up in the west, my knowledge and experience with Sikh history came mostly through stories and books. Aside from occasional visits to India, what I knew and saw of Sikh history was predominantly left to my imagination that provided to me a visual to the words I read or the static pictures I saw. Sometimes, I wonder if it’s this almost theoretical experience that results in the dissociation many Sikh youth feel from their history. The dissociation was not so much for me, however. Even as a child, I loved Sikh history and couldn’t get enough of reading about it. My trips to India were opportunities to see with my own eyes the historical and religious sites that I constantly read about. My childhood attraction to the stories of our past was why, as an adult over 10 years ago, I was so excited to attend the Arts of the Sikh Kingdoms exhibition that traveled to various museums in North America. At the end of the day in which I went to finally see the exhibition, museum staff had to almost push me out so they could finally close for the day. I was just too in awe of the many artifacts and relics that brought to life what was previously relegated to verbal description in books. The Asian Art Museum in San Francisco, California is currently displaying relics and artwork related to the kings of India through the 19th century. Among those is included the throne of the Sikh king, Maharaja Ranjit Singh. Other pieces in the exhibit take us back to the lives of the Sikh and other Indian maharajas. The Maharaja exhibit is in addition to and borrows from the museum’s permanent collection of South Asian historical artifacts and artwork that includes various articles from Sikh history and particularly from the Ranjit Singh period (early to mid-nineteenth century). The Fresno Art Museum in collaboration with the Smithsonian Institution is celebrating the opening of a new exhibition “Sikhs: Legacy of the Punjab”, on January 19th. 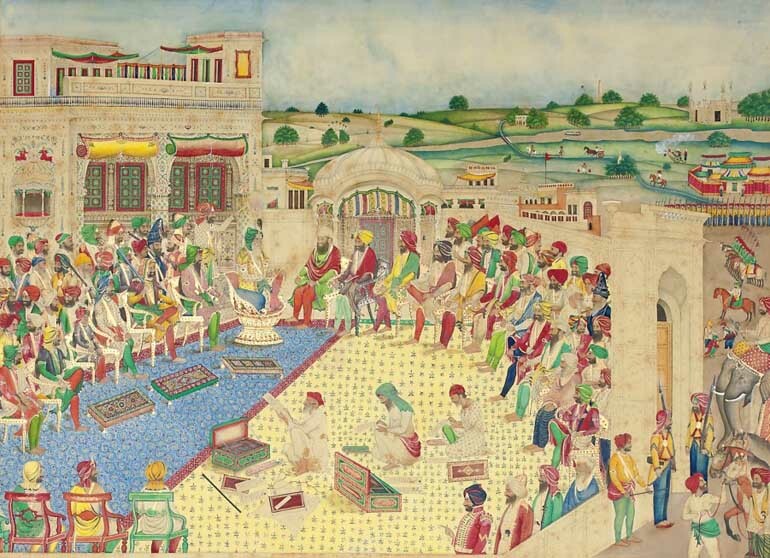 The exhibition presents Sikh artwork and artifacts produced from the 18th century to the present, including miniature paintings; arms and armor; traditional textiles and dress; coins; musical instruments; sacred texts; and modern works of art. It also includes a scale model of the Darbar Sahib (commonly referred to as the “Golden Temple”), a Sikh sacred space at Amritsar, India. Both exhibitions end in April and would make for great opportunities to take in and make real the elements of our past that are not normally accessible. Views expressed by the author of this blog do not necessarily represent those of any other group or organization.